Oscar Wilde said "I never travel without my diary. One should always have something sensational to read on the train". On Twitter, Stephen Fry has declared today Oscar Wilde Day and I wonder if Wilde were alive today would have been reading an eBook on the Tube? He would have definitely blogged though, and I'm sure his blog would have been made into a physical book at some point. 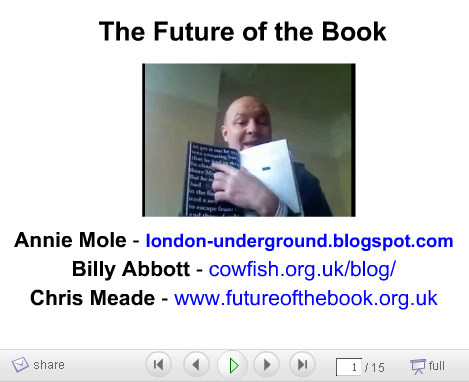 At our Future of the Book session at Amplified08 last week, me, Billy Abbott & Chris Meade from the Future of the Book think and do tank, led a discussion about what might happen to the paper book in the future. This also led us to talk about writing and the concept of authors. Now that it's easy to publish through blogs - would we see more websites becoming books? 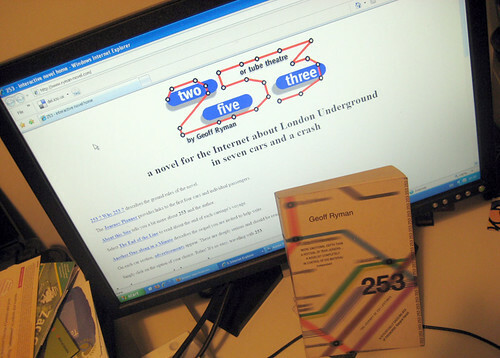 Novel 253, about 253 passengers on the London Underground before the train crashed, was probably the very first online story I read. This was years before blogs even existed. The internet gave Geoff Ryman the perfect way for people to jump from character to character in the Tube carriage, without the reader being bound by a more linear constraint. However, at the time more people would have heard about it when it was published as a real book. I was amazed and really grateful for all your thoughtful input into our session, when I asked for your thoughts on the future of the book in a blog post last week. We've put the slides from the session up and if you download the presentation you can see the full notes. Nicole from Girl Geek Dinners, was superbly speedy and wrote a blog post on the discussion too. The last slide has some networks, online & physical groups and suggestions on where to go next. On the 2nd December Channel 4 are holding a debate - Game Up (it's sold out, but there is a waiting list) with the Reading Agency & Cory Doctorow and others, on whether games are the new reading. 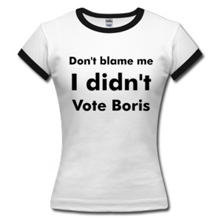 However, you can contribute to online discussions here. Also, if you're in London on the 10th December, there's a Mini Geek Dinner on the Death of Reading with Adrian Hon, the chief designer behind Perplex City the "world's first commercially successful Alternate Reality Game (ARG)". We did argue whether ARG's would become the new books. Thanks so much for adding to the discussion (to those both at Amplified08 and people who added comments to the blogpost) and please continue, as we'd be really keen to hear what you think of the ideas touched on in the slides.